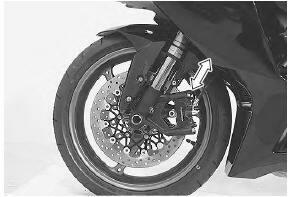 the right and left front forks are installed symmetrically and therefore the removal procedure for one side is the same as that for the other side. Remove the front wheel. 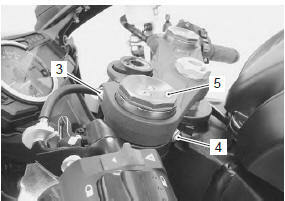 Refer to “front wheel assembly removal and installation” in section 2d . make sure that the motorcycle is supported securely. 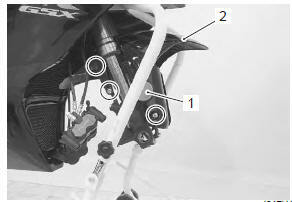 Do not operate the front brake lever with the front wheel removed. 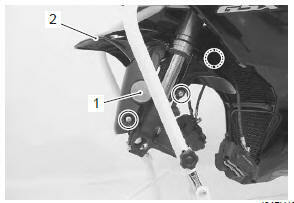 Disconnect the brake hoses from the clamps on the front fender. 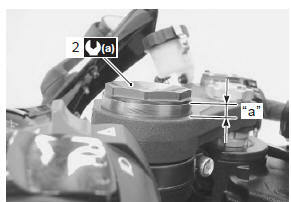 Loosen the front fork upper clamp bolt (3). 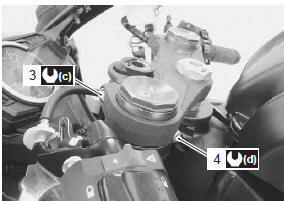 Loosen the handlebar clamp bolt (4). slightly loosen the front fork cap (5) to facilitate later disassembly. Loosen the front fork lower clamp bolts (6) and remove the front fork. hold the front fork by hand to prevent it sliding out of the steering stem. Set the front fork to the steering stem lower bracket temporarily by tightening the lower clamp bolts (1). 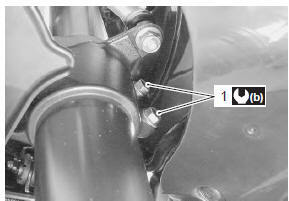 Tighten the front fork cap (2) to the specified torque. Loosen the lower clamp bolts. Set the front fork with the edge of the outer tube positioned 7.0 Mm (0.28 In) “a” from the upper surface of the upper bracket. Tighten the front fork lower clamp bolts (1). Tighten the front fork upper clamp bolt (3). Tighten the handlebar clamp bolt (4). Install the front wheel. 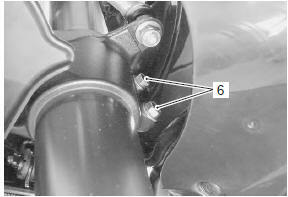 Refer to “front wheel assembly removal and installation” in section 2d . remounting the brake calipers, pump the brake lever until the pistons push the pads correctly. before tightening the front axle bolt and front axle pinch bolts, move the front fork up and down four or five times.